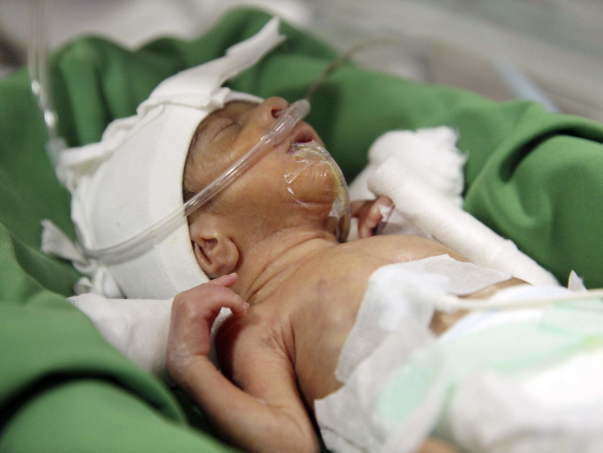 Only 6 days in this world and Bindu’s baby is already fighting a battle of life and death. 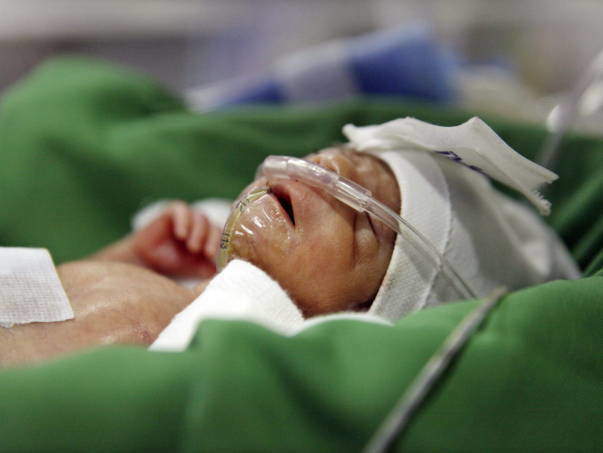 Born prematurely at 28 weeks, the baby boy weighs only 700 gms. He was immediately rushed to the NICU as an emergency. He isn’t strong enough to breathe on his own anymore. He’s extremely fragile as his organs are still underdeveloped. Only continued medication and hospital care can help him survive. 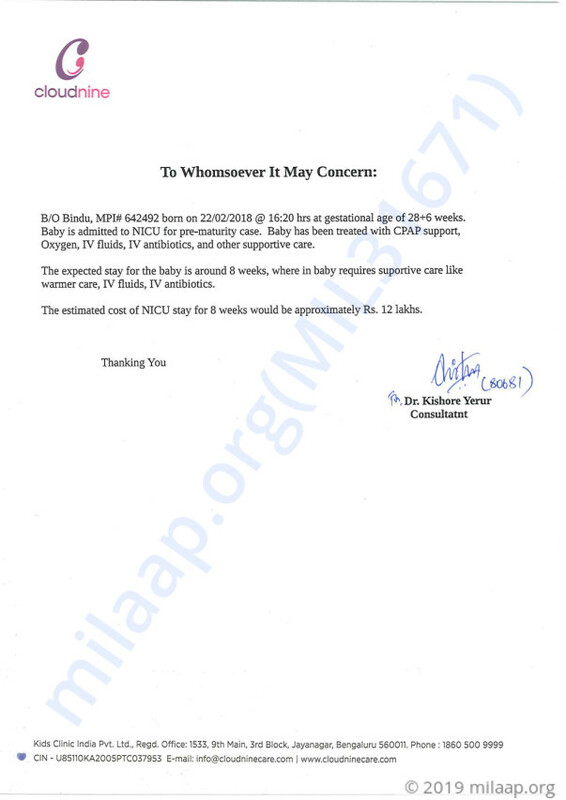 These first few weeks are extremely crucial for Bindu’s baby. Without hospital care, the baby won’t make it. 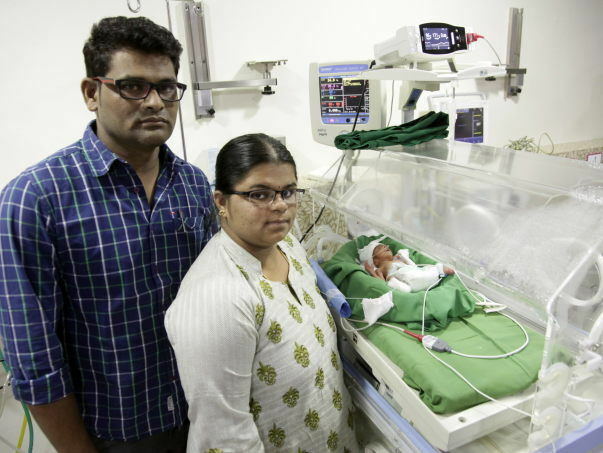 Bindu and Dhamodharam’s baby boy was delivered unexpectedly at 28 weeks. Bindu was hoping for a normal delivery until the day she noticed that her baby wasn’t moving. Bindu’s baby is too fragile to make it on his own now. His organs are underdeveloped, and he can’t breathe on his own. He’s in the NICU on oxygen support, pumped with antibiotics that are keeping him alive. The only sounds he hears all day is the beeping of the machines. His parents haven’t been able to even hold him yet, but this is the only way their baby can have a chance of future. After the delivery, Bindu was hospitalized for 2 days. The pain of not being able to even see her baby far exceeded the physical pain of the surgery. However, this is not the first time Bindu and Dhamodharam have been through this horror. Their first child was born premature and was in the hospital for 26 days, but she’s now 4-years-old, active and healthy. They never thought that this would happen to them again. The only chance that Bindu’s baby has is to stay in the hospital for the next 8 weeks. Along with Bindu and Dhamodharam’s fears, the bills are only piling up. Their baby had an unfortunate beginning, but it’s not too late to save him and give him a better future. However, Dhamodharam is struggling to continue his baby’s treatment and needs all the help he can get. 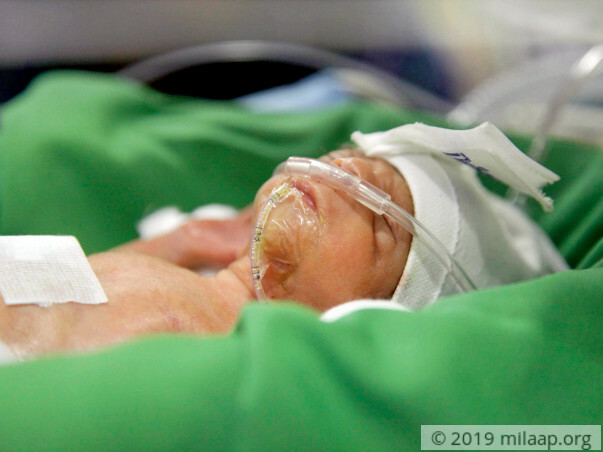 Bindu’s baby was rushed to the NICU seconds after his birth. 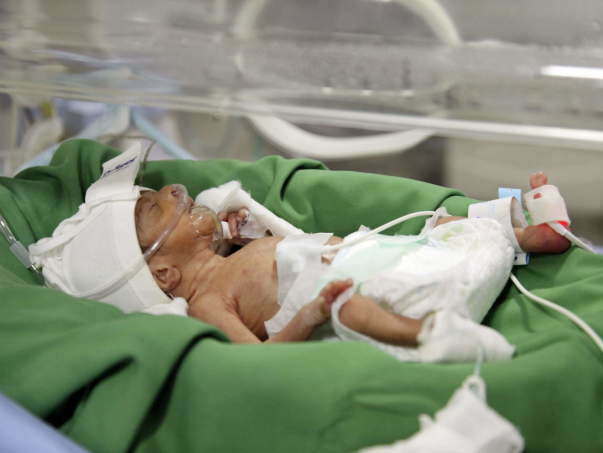 He was born premature and isn’t strong enough to make it on his own yet. He can’t breathe on his own and needs to stay in the NICU for 8 more weeks. Dhamodharam works in a private company and can’t afford to continue treatment. With your help, the little fighter can be on the road to recovery and have a healthy future. Your support can save Bindu’s baby’s life. We have some unfortunate news to share with you. Bindu's baby passed away on the 12th of March. 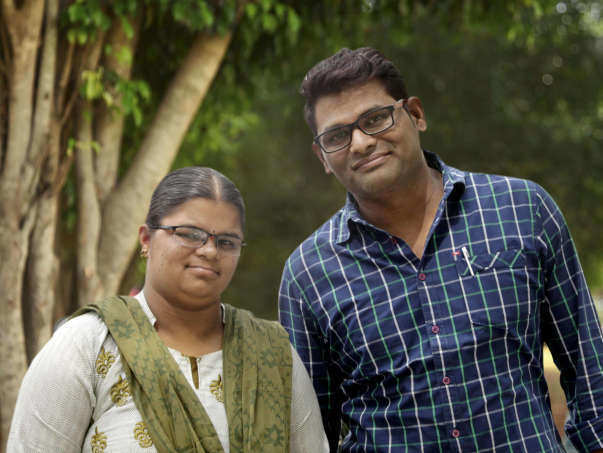 Bindu and her husband Dhamodharam appreciate all the support you have shown towards their baby. The funds raised will be utilized for any bills incurred by the family during the treatment. Our thoughts and prayers go out to the family in this difficult time. Thank you for your overwhelming support. Our little baby's health is improving now. He is still being supplied oxygen externally. The heartbeat is under control. The doctor fed him about an ml of milk yesterday and he could digest it. We are staying strong and hopeful. Our baby is likely to stay in the hospital for further treatment for about 2 more months. Thank you for the support. Please keep supporting us. Do pray for his health and speedy recovery. Will keep you posted.